It’s that time of year! Lots of us are in the giving mood and are looking for great gift ideas, so we’ve put together a list of some local gift ideas for the foodie in your life. Let’s start off with the obvious. 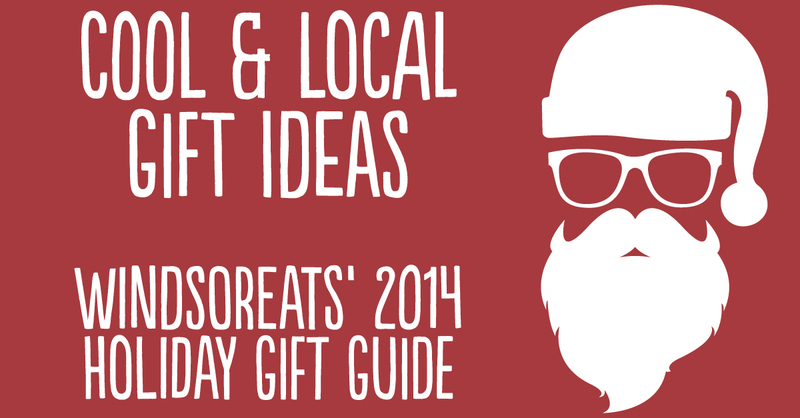 Gift cards are fool proof, especially when they’re to one of our many great restaurants in Windsor-Essex. If someone you know loves cooking up great cuts of meat on the grill, you can always provide them a gift card at The Butcher of Kingsville. For those who are very health conscious, introducing them to Beets & Berries might be a good choice. Pre-planned meal plans at Just Jeff’s or Thyme to Go are also excellent gift options for those busybody types who don’t always have time to cook themselves the good meals they deserve. Helpful tip: Instead of getting one gift card of a very large denomination, split the amount you’re giving onto two or three different gift cards from different restaurants or businesses to mix it up. 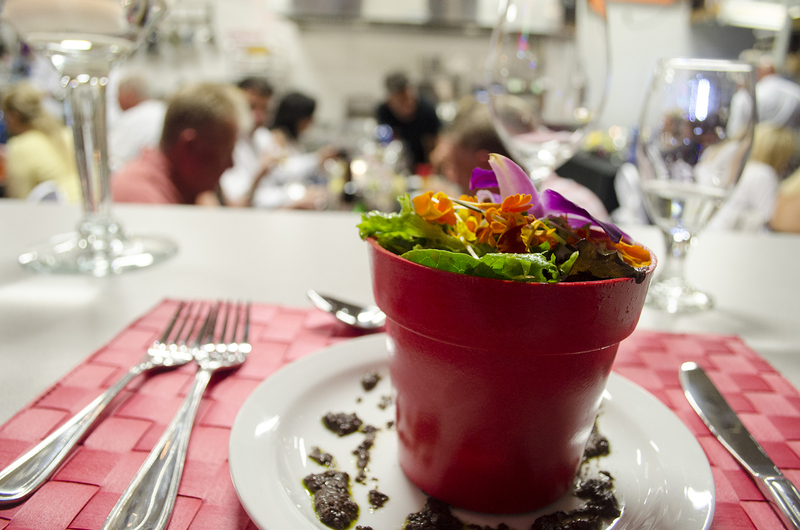 Gift a tasty seat at a Williams Food Equipment or Oxley Estate Winery cooking class! Are you looking to give a gift for someone who is culinarily challenged but loves food? Give them the opportunity to brush up on their cooking skills. If you’re looking to stay within city limits, Williams Food Equipment is offering a cooking class series with Chef Glenn van Blommenstein throughout the winter. From January through to the end of March, each week will showcase a different cuisine to learn. In the county, Oxley Estate Winery, located in Harrow, will also allow your giftee the opportunity to have a tasty, hands-on experience. The winery will be offering 6 classes through January and February that will excite your senses and lead participants through an interactive cook and eat experience. Rino’s Kitchen is also offering courses throughout 2015. One of our favourites is the Hands on Sausage Making Class on Sunday, January 18, 2015 at 1:00pm. Rob Bornais of Robbie’s Gourmet Sausage Co. will be on hand to guide you through the process of making your own homemade sausages from scratch. Rob will make a traditional sausage as well as a unique flavour, something that he is becoming famous for. This class will run approximately 3 hours and includes beer sampling from Walkerville Brewery to accompany the sausage samplings. You will also be taking home approximately 2-3lbs of sausages to cook at home. Space is limited to 12 people. Cost is $80 per person. Helpful tip: If you book the entire series at Oxley, you will save yourself some money. Sometimes people already have all the material things they could want and are just looking to create new memories with those in their lives. These WindsorEats tours will be just what they’re looking for. 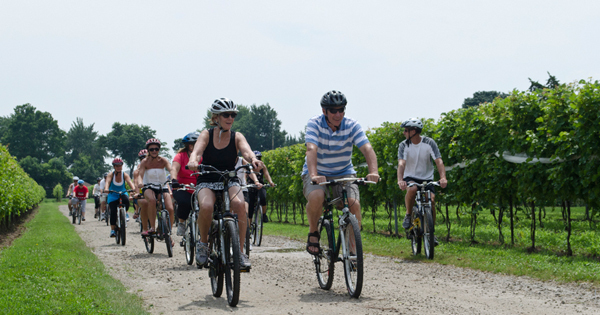 For the entire month of December, the Wine Trail Ride cycling tours are being offered at discounted prices, both for individual tickets and with bicycle rentals. 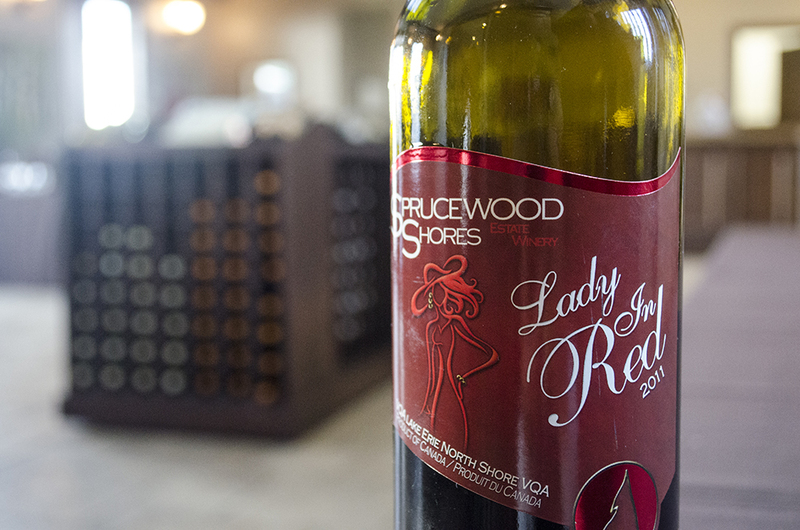 We visit up to 3 wineries for tastings and tours and finish off the day with a locally sourced long table feast. Having been named the best culinary tourism experience in Ontario as well as innovator of the year for the entire Canadian tourism industry, don’t you think your loved one deserves the best? If they like bikes but wine isn’t their thing, maybe a Bikes & Beers cycling tour is more up their alley. Have them explore the city one beer at a time visiting local craft breweries and pubs for great food and even better beer. If the person your shopping for isn’t really one to jump on two wheels, The Drinks of Walkerville walking tour is the gift to give. 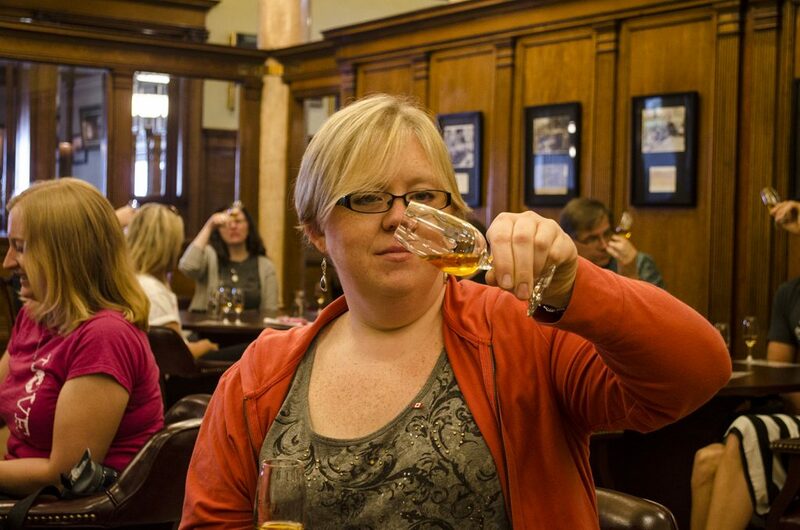 Recently selected as an Ontario Signature Experience, they receive a history lesson on Hiram Walker and his namesake town all while enjoying the drinks that made them both popular. Helpful tip: If you’re interested in either of the bike tours as a couples gift, we recommend booking a tandem bicycle rental. Also, be sure to tell your guest to book alternative transportation for the Drinks of Walkerville tour. There’s lots to sample! Are you giving a gift for a whisky lover? The Canadian Club Brand Centre has some great items in their gift shop including whisky rocks and Canadian Club glassware. However, one gift idea that many people don’t realize they offer is the personalization of the Canadian Club labels on bottles of whisky with whatever message you would like printed on them. Put all those items together and you have a pretty fantastic gift for any whisky lover. The labels are available by calling 519.973.9503 x 205 or emailing info@canadian.com. They fit the Canadian Club Premium 1.14 bottle. The label can contain up to 4 lines of text with 35 characters per line. It usually takes at least 48 hours to prepare the label and bottle. The cost is $10. 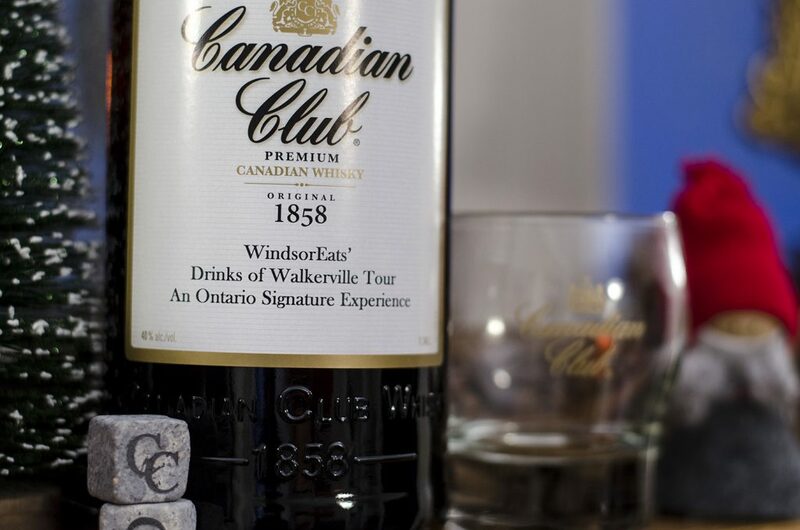 Helpful tip: The Canadian Club Brand Centre does not sell the bottle of whisky, so you’ll need to buy your own, but, they will swap a bottle upon label pick up to make it easier for you. Wine. It does your body good. That’s the saying, right? A bottle of whisky makes a great gift, but so do other locally made drinks! If you’re buying for a beer drinker, Walkerville Brewery and the recently opened Brew are offering some treats that would make any craft beer lover shed a tear of joy. Walkerville Brewery has just released a limited edition holiday growler that you can fill with any of their creations, while Brew is offering a collection of glassware and bottles topped with their lager. You can always head out to any of the local wineries and pick up a bottle of wine and some knickknacks, or you can let them do the work for you and pick up beautifully wrapped gift baskets. Some are filled with wine and chocolate, wine and glassware, or wine and books. The good thing is, they’re all beautiful and they all have wine. Always a plus in our books. For those that need a cup of joe or five in the morning to get them going, we recommend heading over to Salute Espresso Bar and purchasing some of their beans which are roasted in-house. Helpful tips: Most wineries will customize the gift baskets for you. Call in advance to see if your favourite one does. Also, Walkerville Brewery and Salute Espresso Bar are next door to each other and have collaborated on a Coffee Porter. It makes a great opportunity to pair complimentary gifts from both locations. 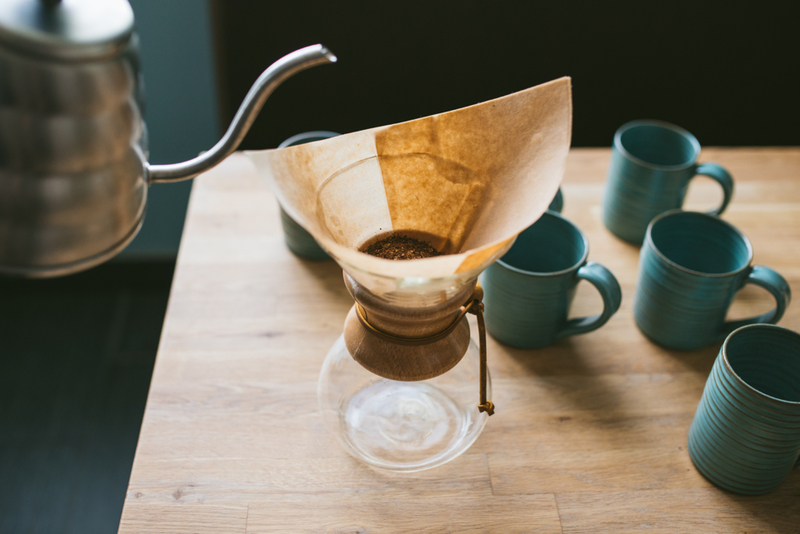 Handmade pottery for your coffee, from Anchor Coffee House. No, we’re not telling you to be violent! Head over to Anchor Coffee House for custom made pottery coffee cups. Each piece is made by hand from Red Clay Stoneware. Sizes range from 3oz espresso/macchiato cups, 6oz cappuccino cups, 12oz coffee mugs, 12oz latte cups and their brand new 14oz travel mugs. Helpful tip: The pottery is one of the best conductors of heat and perfectly preserves the taste of any hot beverage. If you’re looking to give a gift to someone who loves to be in the kitchen, Williams Food Equipment is the place to go. Here are a couple of our favourites. Any tea lover with style would love one of these colourful Le Creuset kettles. 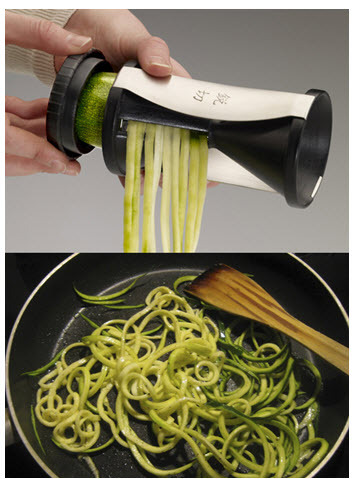 The Gefu Sprializer will help any home chef make easy work of turning fruits and veggies into thinly sliced noodles. Helpful tip: If you’re a fan of Le Creuset, Williams has the largest selection of their products that we’ve ever seen. They also have great knickknacks for those who enjoy a drink or two, like the Corkcicle. You take it out of the freezer and place it on your wine bottle to keep it cool. How can you resist stylish AND tasty?! Looking for something simple to place in a stocking? 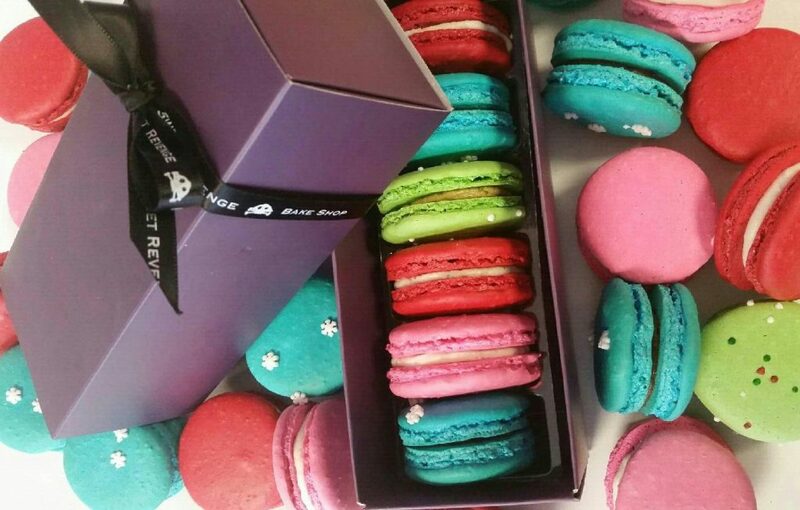 French Macarons from Sweet Revenge Bake Shop. If not in a stocking, they’re just great little gifts to have on hand should the need arise to give…..or eat. French Macaron gift boxes are 6 box for $15, 12 for $25 or 18 for $36. Helpful tip: Stuck on what flavour to get? The salted caramel and the gingerbread flavours were our favourites. Iron Kettle B&B are currently featuring gift certificates (limited time only) for the holidays. They come in packages that include a 3-course meal and a night’s B&B stay for $185 per couple, which also includes breakfast. 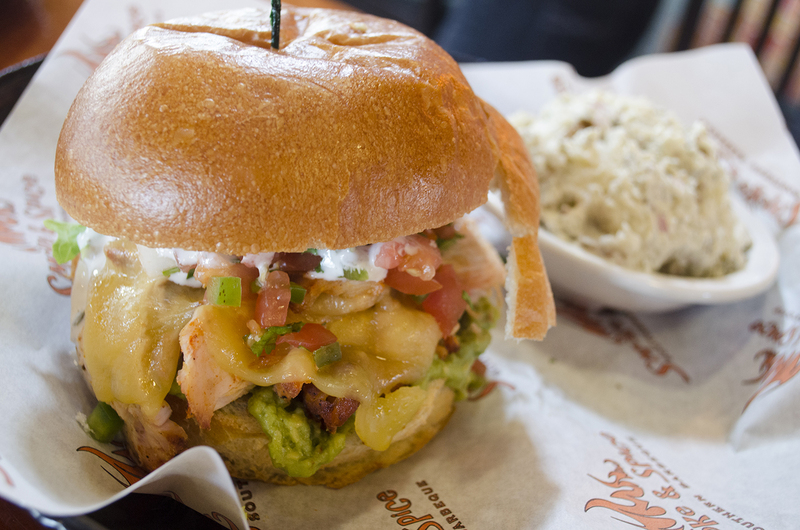 The meal features local and seasonal soup or salad, main course and dessert. Iron Kettle’s guests wake up to the aromas of freshly brewed coffee and baked pastries in the morning. Mmm mmm! 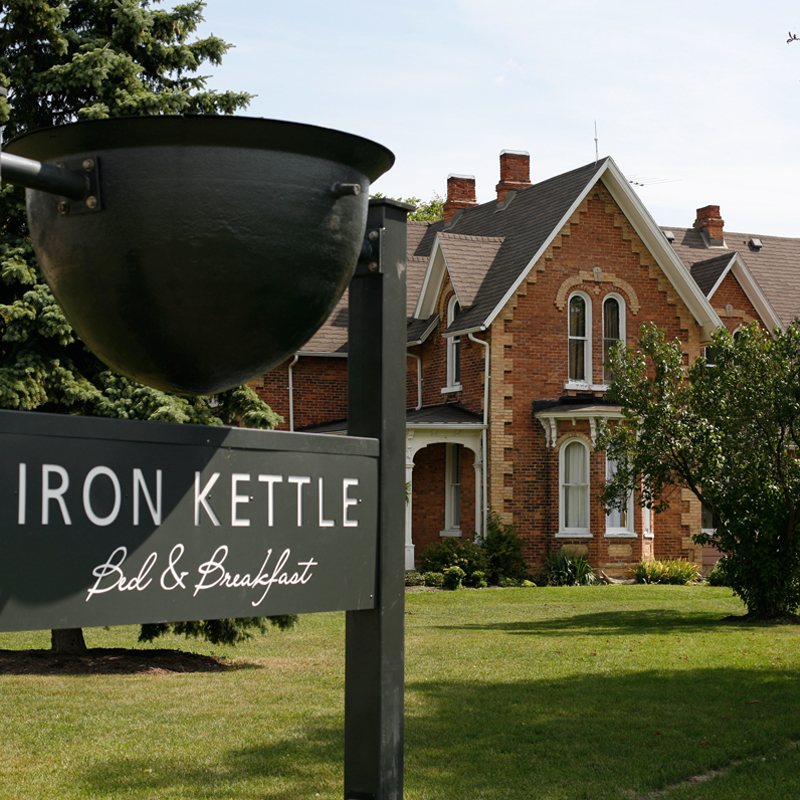 Use Iron Kettle as home base for exploring Windsor-Essex or, if you really feel like splurging, pair it with two tickets to our Wine Trail Ride with a tandem bicycle rental for a true culinary experience. Helpful tip: Talk with Ben about customizing your experience at Iron Kettle. 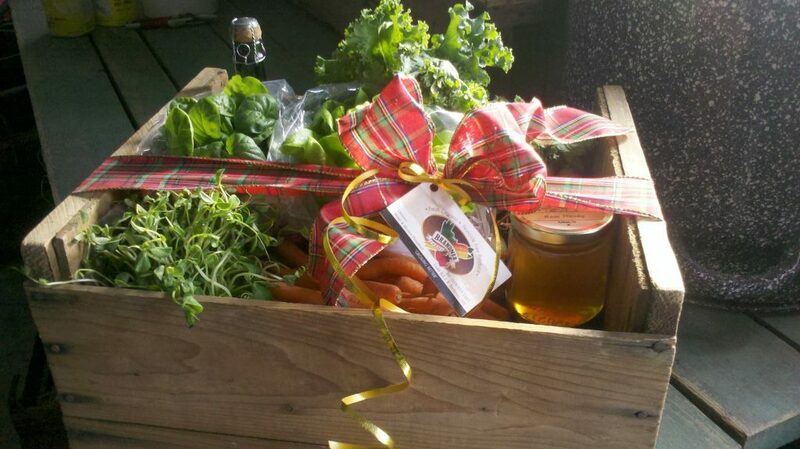 How about giving someone a crate full of healthy, organic food? Bet you never thought of that! Brandner Farms is allowing you to pick the price and they will fill a wooden crate full of organically grown vegetables plus your choices of jams, raw honey, and fresh eggs. There is a $30 minimum to order. Contact Brandner Farms to order or for more details. Helpful tip: Ask Monica about signing up for a weekly food crate full of pesticide free, organic produce. It’s well worth it!